Wild: Phiomia ignavus is another herd animal on the island. They are small enough that almost any predator can bring them down, but large enough to provide plenty of meat. Domesticated: While it is completely possible to ride a Phiomia around, they are a meager choice. They work very well, however, as pack-mules. And I’ve seen some communities keeping a herd of these around as livestock. The Phiomia require protection though, as they are terrible fighters. Known Information: Were it not for the protection of the herd, and their instinct to run from any predator, these would almost certainly be hunted to extinction. 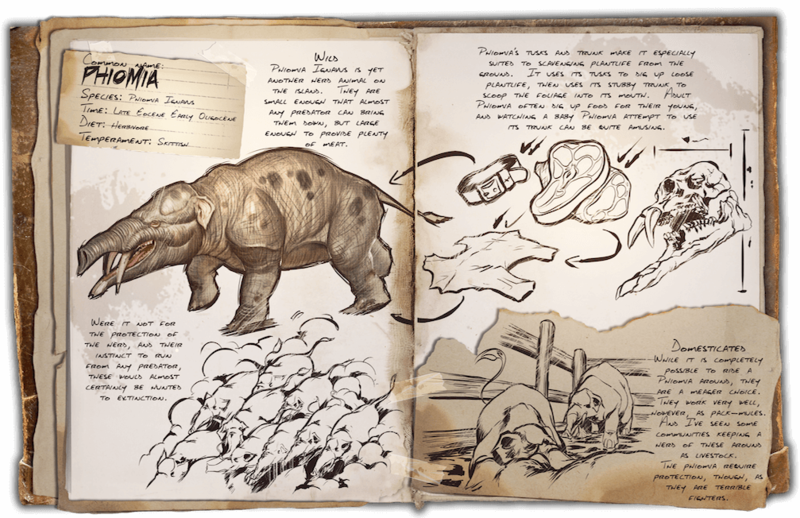 A Phiomia’s tusks and trunk make it especially suited to scavenging plant life from the ground. It uses its tusks to dig up loose plant life, then uses its stubby trunk to scoop the foliage into its mouth. Adult Phiomia often dig up food for their young, and watching a baby Phiomia attempt to use its trunk can be quite amusing.